Who decides how you wear your hair? If you happen to be a member of the United States Military, the answer to that question is Uncle Sam. Now some people think Sam needs a new coiffure. "Many hairstyles are acceptable, as long as they are neat and conservative." "Neat" and "conservative," however, are pretty subjective. "African American women have often been required to meet unreasonable norms as it relates to acceptable standards of grooming in the workplace." They go on to posit that the amount of time and even money African American women must contribute to maintaining Army-appropriate hairstyles is unfair. Several thousand signers of a WhiteHouse.gov petition agree, and the Department of Defense is currently reviewing the issue. The issue of appropriate hairstyles and race extends beyond the military, however. Last fall, twelve-year-old Vanessa VanDyke and seven-year-old Tiana Parker were threatened with expulsion from their schools for wearing an afro and dreadlocks, respectively. Public outcry followed both cases. 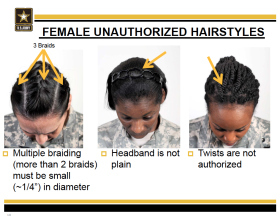 Are the army hair regulations racially biased? Or are people getting themselves in a twist over nothing?